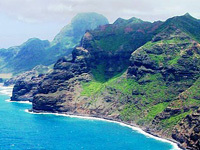 Experience the majestic grandeur of Kauai, The Garden Island, on our Untamed Kauai Airplane Excursion. 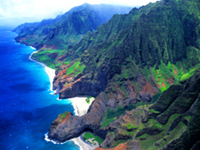 Kauai is rugged with much of the islands natural beauty only accessible from the skies. The exhilarating airplane tour will take you over amazing natural wonders and hidden places that can only be seen from the air. 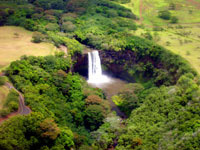 On our Untamed Kauai Airplane Excursion, you will soar over dense rainforest with lush foliage and then climb the mountain slopes for a breathtaking view of Waimea Canyon, The Grand Canyon of the Pacific. 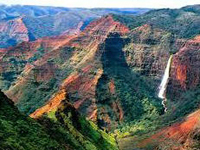 Carved over centuries by the Waimea River, this dramatic gorge is massive. The cliff sides have been sharply eroded exposing colorful deep red, brown and green hues. Waterfalls and frequent rainbows enhance the natural beauty of this pristine location. 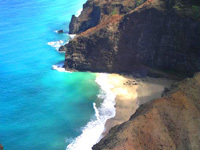 As you head over the North Shore the magnificent Na Pali Coastline appears. Words cannot aptly describe this sculptural masterpiece with dramatic sheer, jagged cliffs that plunge to the deep blue ocean and numerous secluded white sand beaches dotting it's coastline. This area is picturesque and stunning. 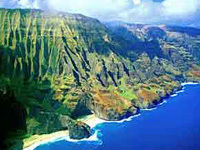 The Na Pali Coast has been featured in numerous motion pictures beginning with Bali Hai in South Pacific and including Hollywood films of Jurassic Park and Lost World. Fly this spellbinding coastline and see the sheer number of dramatic cascading waterfalls, then take in the beauty of pristine Hanalei Bay. 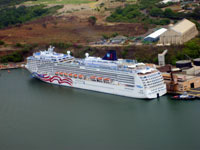 This tour is a unique opportunity to marvel at visual sensations that you will remember for life. Our airplane tours feature state of the art air conditioned aircrafts with high visibility windows and in-flight Intercoms for direct one-on-one communication with pilot and other passengers. 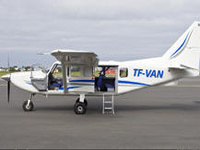 After careful consideration, Island Marketing Ltd is proud to offer our Kauai Airplane flight in lieu of a helicopter tour for Kauai. 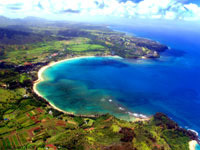 Kauai is beautiful from the air, and our airplane flight is designed to give the best tour of all of the dramatic landscapes of the Garden Island. Airplane flights are superb to helicopter flights in numerous ways. Not only are our airplane flights very quiet in comparison to all helicopter tours, but our touring airplanes use only a fraction of the fuel that a typical helicopter consumes, therefore making our tour much more eco-friendly than any helicopter flights. From quiet and comfortable flights, to huge viewing windows and guaranteed window seats for all passengers, plus no weight restriction and an eco-friendly aircraft, we are very proud to offer this tour to you. Enjoy your flight!